So we’ve already started the hot, dry, smoky season here. Generally it’s smoky because they burn the sugar cane fields and the processing plant to the north of us throws out a lot of ash and smoke while processing the sugar cane. However as we’ve found out happened in 2010 when we first got here and is happening again this year, in dry years the fires get worse. Similar to what happened in the US this year, fires have started getting out of control in Bolivia. When these fires get out of control in rural areas, there’s little more than men with buckets and rugs to beat them back. Just a few days ago a huge chunk of land owned by the Santa Cruz airport burned out of control but luckily the airport has firefighters and were able to keep stop it before it got to the airport. Many of these fires are human-started. 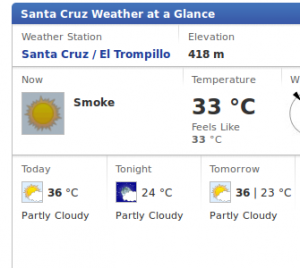 The majority of the fires are in the department of Santa Cruz (us) and the department of Beni (north of La Paz). According to a recent article in our newspaper El Deber, the vast majority of the burning is associated with cattle farming and agriculture. Why these fires started is a more difficult question though. We know that farmers burn forest to clear the land; they also burn trash and according to the newspaper today, many farmers have claimed the fires came across the border from Brazil. However since the same article said the authorities were fining anyone found starting fires, the truth is probably getting buried. Burning can also be part of the yearly harvest cycle for crops such as sugar cane and what starts as a controlled burn could get out of control. Beni and Santa Cruz are the main agro-business regions in Bolivia so it would make sense that so much burning is centered here, particularly during sugar cane harvest. So we have man-made fires burning out of control with inadequate ability to fight them, but the problem doesn’t stop there. Coincidentally the departments of Beni and Santa Cruz are also the regions where the Amazon rainforest spills down into Bolivia. And as a recent article picked up by nbc.com, “Bolivia park declared one of most diverse places on Earth” explains nicely, this region has huge biodiversity significance. You know the stories about a scientist going deep into the rainforest and finding some fungus that cures this disease or that disease. This is that forest. El Deber reports that since January over 1000 fires occurred in forest reserves and protected areas. (How large those fires were is not clearly explained however). I don’t believe Madidi National Park, which the nbc article talks about, has had any large fires but they are certainly not out of danger. This entry was posted in Bolivia, Social Justice by Laura. Bookmark the permalink.